Please join Maria in class to create this lovely gourd jewelry pendant. You have the choice to pick Turquoise, Coral or Onyx beads to your pendant. Many of Maria's techniques are taught in this class along with the use of Aluminum tape that everyone is excited about. You will learn how to make the finding connections easily so you can create other jewelry with ease. Learn how to master the use of aluminum tape technique and the many choices you have to create the desired texture using this tape. You will receive all the necessary supplies need along with step-by-step color instructions. I accept Pay Pal, check or cash for this class and my policy is of you need to cancel after making payment, there is no refund, however, you will receive all suppplies and products to create this class or you may sell your seat to a friend. Please join Maria in class to create this lovely gourd wall hanging. Many of Maria's techniques are taught in this class and a color step-by-step instruction is included. 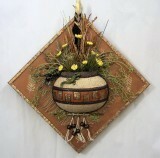 The canvas is 10x10" with a gourd filled with desert plants. The canvas has 1/4"
In the center of the gourd the design is woodburned and mica is set inside the design. Faux leather braid embellishes and frames the design. The remaining area of the gourd is covered with texture sand. The back of the canvas is finished with a professional look of brown paper covering the open canvas and wire is attached making it ready for hanging. You will receive a generous amount of supplies and products to complete this class. This requires me to prepare kits as soon as possible so I ask you to make your commitment as soon as possible and no later that December 1, 2018. I accept pay pal, check or cash for this class and my policy is if you need to cancel, there is no refund. You will receive all the items needed to complete this project or you may sell your seat to a friend. The VFW is a lovely, spacious room and on the other side is the lodge. They offer beverages with a donation and a reminder to bring your lunch since it is an all day class. I look forward to seeing you in class and at the festival.